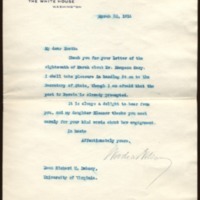 Woodrow Wilson writes to Richard Heath Dabney regarding Hampson Gary for ambassador to Persia. Thank you for your letter of the eighteenth of March about Mr. Hampson Gary. I shall take pleasure in handing it on to the Secretary of State, though I am afraid that the post in Persia is already preempted. It is always a delight to hear from you, and my daughter Eleanor thanks you most warmly for your kind words about her engagement. Wilson, Woodrow, 1856-1924, “Woodrow Wilson to Richard Heath Dabney,” 1914 March 20, WWP20500, University of Virginia Woodrow Wilson Letters, Woodrow Wilson Presidential Library & Museum, Staunton, Virginia.